Back row: Keith Wright, Pamela Rotner, Corrine Holding, Claire Nicholls, Mark Crowhurst. Middle row: Greg Petty, David Guy, Heath Willemse, Neville May, ?? ?, Colin Goodwin. 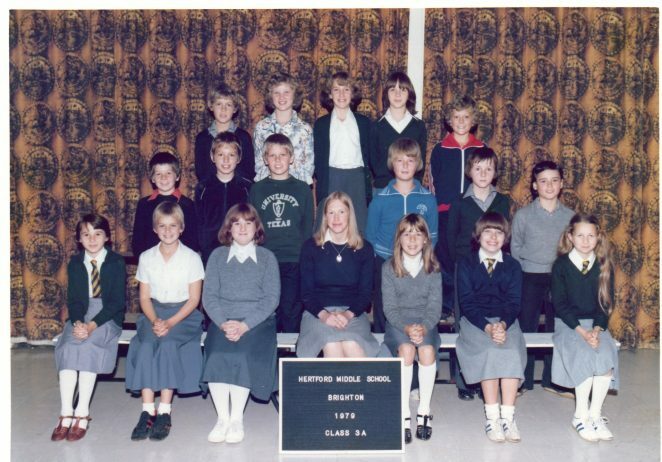 Front row: Lynn ?, Louise Wallis (decd), Sarah Pollington, Teacher ?, Raynor Windsor, Lisa Steyning, Rachel Horner. Do you recognise yourself or someone else? Can you share your memories with us? Please post a comment below. Greg Perry (not Petty). Girl in front row is Lynn Simmonds. Boy next to Neville May is Stephen Matthews. Teacher is Mrs. Aitkens. I was at Hertford school 1976-1980. I remember some people in the 1978/79 photos. Those curtains in the main hall are so 70’s! I remember the teachers in the photos too. Mrs Cromer was head mistress and there was Miss Davies, Ms Tozer, Mr Carter, Mr Simmonds and Mrs Ramsey. I remember that the stage area in the hall had fold back doors that when closed, formed another class room. I enjoyed some great school trips too. I particularly remember Miss Davies and her partner Calvin taking us to the needles on the Isle of Wight, and a day trip to Arundel Castle. We also had a lesson on teeth cleaning with pink tablets that showed up where you had missed brushing. There were some cookery classes and we tried to make butterscotch which never set properly. I did learn to make a mean apple crumble that I still make today. Fond memories of a great first and middle school. I have class 4T photo also from 1979. The teacher is Miss Tozer. I have written all the names on the back of the photo. The head teacher then was Mrs Cromar. Is there anyway I could get a copy on to here? I was Brenda Francis back then.